Sometimes, you encounter a treat that becomes your nemesis. Until last year, honey cake was mine. I first read about honey cake in Miriam’s Kitchen, an excellent book by Elizabeth Ehrlich that explores the connection between food and family, history, and tradition. The author described her Great-Aunt Dora’s honey cake as a rich, aromatic confection that was baked to celebrate Rosh Hoshannah in the hope of a sweet new year, and it sounded exactly like something I’d love to add to our holiday table. Great-Aunt Dora’s recipe was included in the book, but when I baked it the outside burned, while the inside remained gooey and inedible. 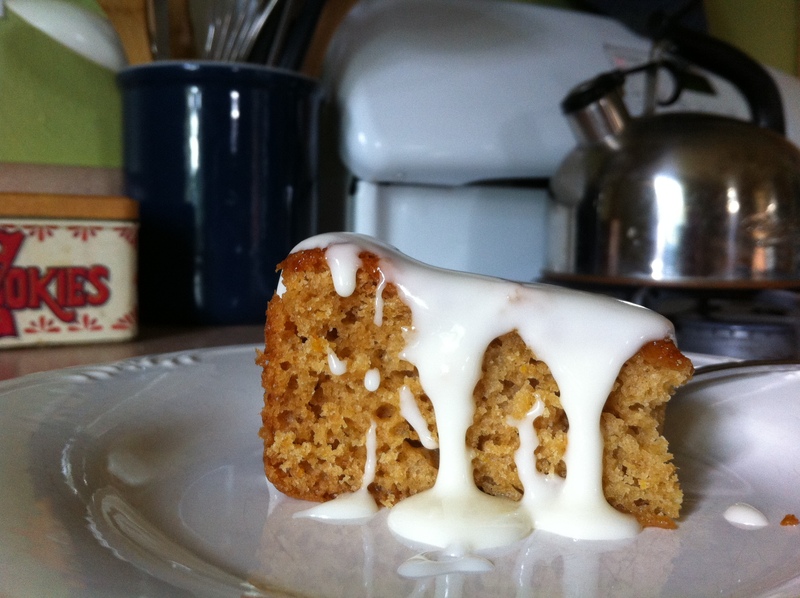 Years of honey cake experiments ensued, during which I tried different recipes each time, all with similar results. Last year, I scoured the internet for a new recipe, and I found this one, which yields a very successful, spicy orange honey cake. Bake your cake at 340 degrees; the slightly lower temperature allows the cake to bake through without burning. Check your cake for the first time at 33 minutes; the center will likely still look very wobbly, so continue baking for 3 minutes at a time, checking frequently, until a cake tester comes out clean. My cake bakes for about 43-45 minutes. Grease and flour a 9 x 13 sheet cake pan. In a medium bowl, sift together flour, baking soda, salt, and cinnamon; set aside. In a mixing bowl, combine sugar, honey, vegetable oil, eggs, and orange zest. Beat until combined. Add flour mixture and orange juice alternatively, beginning and ending with the flour and beating until just combined. Batter will be very runny. Pour into prepared pan and bake for 33-43 minutes, until a cake tester inserted in the center comes out clean. Cool completely before serving. This cake can be served as-is or dressed up with whipped cream, powdered sugar, or my favorite, a drizzly icing made of powdered sugar and orange juice.